The other night, my train home was delayed and I had to finish the journey by taxi. As we drove through the city centre, I couldn’t help noticing how at nearly every junction we seemed to catch the red traffic light. There weren’t many other cars on the road, so most of the time we were waiting needlessly. As my family will tell you, I’ve been complaining about this kind of thing for years, because I’ve seen there are better ways to do it. For example, I had a trip to Prague a few years ago and saw that at a certain point in the evening, all the traffic lights in the city started flashing amber. I’m not sure if they were on a timer or if it was when the traffic density went below a certain level, but it seemed like a very sensible solution to me. Instead of waiting around, drivers just needed to check nothing was coming the other way, then carry on. The internet tells me this idea is used in other places too. Another of my bugbears is those occasions where the traffic lights are arranged in such a way that the only person who can’t see them properly is the driver at the front. It usually takes a New York minute before they realise the lights have changed and they can move off. In France, they have had smaller sets of lights at drivers’ eye level as long as I can remember (we’re talking more than 30 years, fact fans). The best example I could find was on this page. They still haven’t caught on over here though. More annoying is when the sequence of the lights is preventing the traffic from flowing properly. I used to play in a band in Sheffield, but was living in Leeds at the time; I often found myself driving the long, empty road from the city centre up to the M1. Some nights Fortuna was with me and I sailed through every traffic light on green, but this didn’t happen very often. I noticed the lights would turn red in order though, starting in the centre and changing one by one as you moved down the road. If you maintained a constant speed, it was possible to get through all the lights in one go – unfortunately, that speed was 42 mph and the speed limit was 30. This just seemed to be encouraging drivers to break the law – ideally the timing should be such that if you stay at the speed limit, you are rewarded with smooth passage. Too fast and you’ll have to slow down and wait before you can get through. The worst sequencing problem though, is those junctions where the priorities are skewed so cars approaching from one direction rarely manage to get through. Park Place in Cardiff is very bad for this. I’ve sketched out an example in fig. 1. below. I say sketch, it’s actually a map, drawn using ArcGIS. The traffic lights are point symbols, manually drawn around each junction, and the arrows and text are dynamic labels. I thought I might have to create annotation to get the labels in exactly the right place, but Maplex managed to get them where I wanted, thanks to the magic Never Remove option. Imagine you are travelling in traffic stream A and you are at a red light. It turns green, but the light for stream C is currently red and the section of road ahead is full of stationary vehicles, so nobody moves. Stream A goes back onto red, allowing stream B to turn green. By now stream C has turned green too, so this section of road empties and immediately fills up again with cars from stream B. Then stream A goes green again, and as before, nobody moves because the road ahead is full of cars. 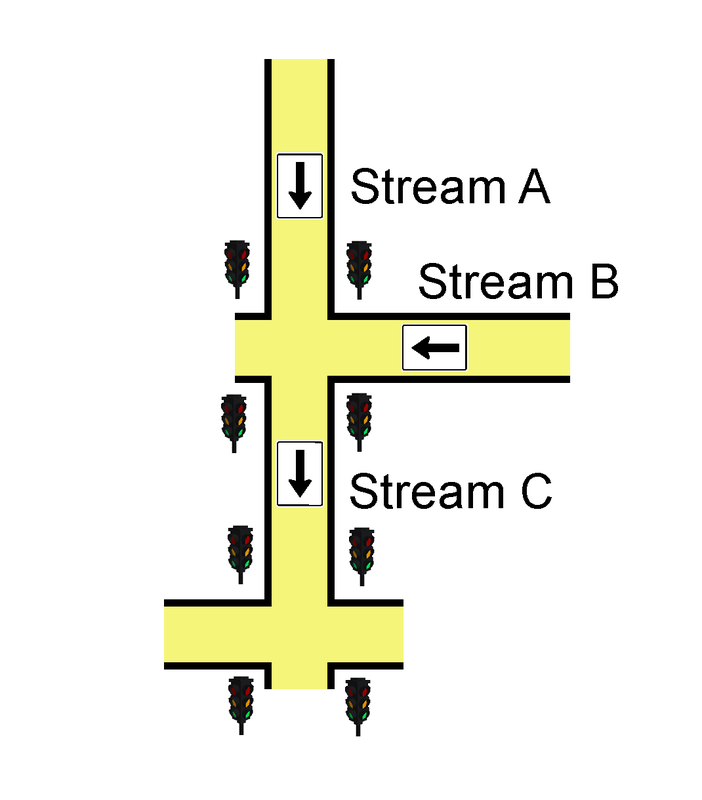 I find this type of situation incredibly frustrating – because the lights at the two junctions are perfectly synchronised, there is never a time when streams A and C are green together, it’s always B and C. The drivers from stream B get to breeze through while everyone in stream A just gets madder and madder. It’s easy to solve though. Instead of having each green light stay on for the same amount of time for every iteration, just vary the time by a random amount, e.g. instead of 30 seconds, make it somewhere between 25 and 35 seconds. The average time on green should be the same, but the two junctions will probably get out of sync eventually and everyone would have their turn. Of course, if I was in charge everything would work perfectly, and everyone would be happy. It’s been a bit quiet on the blog front recently, partly due to illness and partly due to a top secret side-project that I will hopefully be able to talk about here at some point. So, to get back in the saddle, here’s a quick look at something interesting I saw on the Edward Tufte forum. 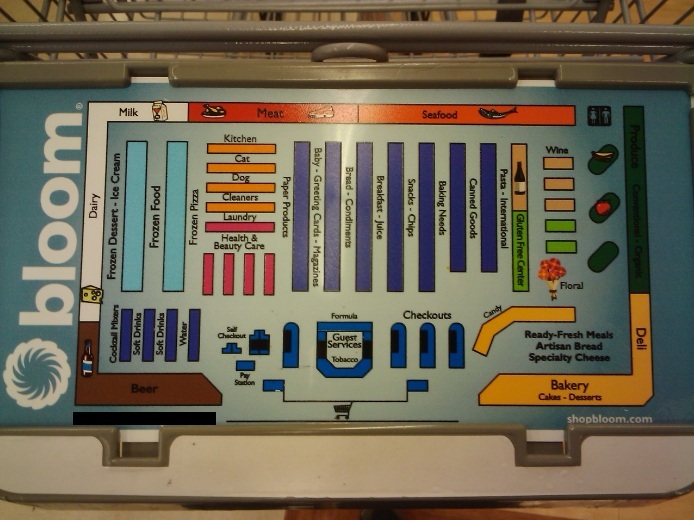 Towards the end of a discussion on instructions at the point of need, a user posted this image of a supermarket cart/trolley (delete according to which side of the Atlantic you are on). What a brilliant idea, I’ve lost count of the number of times I’ve wandered round and round a supermarket trying to find a particular item. Or even a whole section sometimes. Why don’t more supermarkets do this? So, props to Bloom Grocery Store (or Food Lion as it seems to be called now) for helping out customers in this way. If only we came across this kind of thing more often.